This past weekend my daughter and I went to pick up a pizza for dinner. “Mom! There’s a domino on that car!” she shouted before we even got inside. If you couldn’t guess by her exclamation, we went to Domino’s for our pizza. And yes, the delivery car had a very visible domino sticking up on the roof. We walked through the restaurant to pick up our order, and she continued to point out dominoes on the signs, dominoes in the wall art, dominoes on the employee hats. If there was a domino, she found it. By the end of that short trip, my girl definitely knew the name of the restaurant and had the Domino’s logo firmly cemented in her three year old memory. While you might not be into covering your office walls floor to ceiling in wallpaper patterned with your logo (like a Domino’s restaurant), the essence of what Domino’s achieves in their restaurants is something I know you want for your brand too. Make an impact with your customers. The best way you can start building a memorable brand today is by putting your logo to work. To get the most value out of your logo, you should be putting it to work to create an awareness and immediate recognition of your brand! A stand-out logo will not only allow you to introduce people to your business, but it can be used almost everywhere to create a repeated, cohesive, and memorable experience for your customers. I am going to share with you sixteen different ways you can use your logo to create a more memorable brand and spread the word about your growing business. Many of these you can start implementing today! Before you check out the list below, I want you to make a list of your own. Take a look at each step of your client process from start to finish. Make a list of all the different ways you connect with customers during each step of that process—from a first contact through your website, to presentations, to a final client gift or product delivery. Write it all down and evaluate where you could best implement the strategies listed below. Knowing when and how you interact with your customers will help you know which of these strategies will work best to give you the most impact in creating awareness for your brand. Add your logo to these 16 pieces of collateral—a visual used to promote your business—to start building brand recognition with your customers. Along with your name and the name of your business, put your logo on your card! If you are like me, you know that the business cards you receive have a way of sticking around. Whether pinned to a bulletin board or floating around on a desk, having your logo constantly reappearing before a potential client may bring your business to mind the next time they need your service. And thanks to your card, they know who to call! Tip: Do you ship products? Include your business card in with the purchase, and tuck in an extra for your customer to share! It should go without saying, but your logo should be front and center on your website. It will create a sense of “place” and communicate your brand personality right at the start. Let's say you're a Joanna Gaines fan and want to get some gifts from her online shop. You visit Magnolia.com, and a what’s at the top of the page? The Magnolia logo is there setting the stage for your browsing experience! Not to mention you can buy t-shirts, bags, and even gardening supplies with the Magnolia logo on them. All ways the Magnolia team increases recognition of their very memorable brand with their fans. Image Credit: Site screenshot of Magnolia.com. Disclaimer, I didn’t design this site or logo—it’s just a great example of building brand awareness! Branded stationery is a nice way to keep in touch with your clients. Especially in today's world of email and texting, a handwritten note can make a big impact. Make sure that positive touch point is accompanied by your logo, and you've just created a positive, impactful brand experience with that client. Questionnaires, quotes, contracts & invoices. We all send these (probably a lot of them! ), and you should brand them all! You can coordinate your business papers with your logo for a cohesive experience from the first questionnaire to the final invoice. Tip: Even if you use an online invoicing service like Wave, Xero, or Paypal, you can include a logo on your invoice to customize it! If you’re an Etsy seller, update your shop banner section include your logo and build your brand awareness. If you think of your Etsy shop like a brick and mortar store, the Etsy shop banner would be like your store’s front window. This is the space to make your shop feel like it has its own special identity, and isn’t just one in a whole strip mall of gray (or Etsy orange) store fronts. Do your customers need to make appointments with you? Help them remember it’s you they’re coming to see by including your logo on custom appointment cards. Heritage Dentistry’s cards reflect their fresh and clean brand and include all the information for a patient’s next visit. Think hats, shirts, scrubs, jackets, etc. Whether your employees are going out on the town, or you have clients coming to your office, having employee gear embroidered or screen printed with your business logo is a great way to increase brand awareness at the home office and in your community. Tip: A hat, shirt or jacket with your business logo also makes a nice employee gift! Do you give a client gift at the end of your process? You may want to consider adding one! A client gift highlights a positive end result to your client process. A gift could be anything from a reusable tote bag, to a mug, to a custom notebook and pen set. Ferguson Builders uses travel mugs as one of their client gifts. Along with their logo, they have also included their contact information. Every time a client opens his kitchen cabinet in the morning, takes his mug to the office, or shares the mug with a guest, Ferguson Builders is building their brand awareness and getting constant recognition! It’s also a talking point for the homeowner to share who did the beautiful renovation work in their home! This is one of the easiest ways to implement your logo. Upload your logo as your social media profile images. As your posts flow through your followers feeds, your logo will constantly accompany your messages! 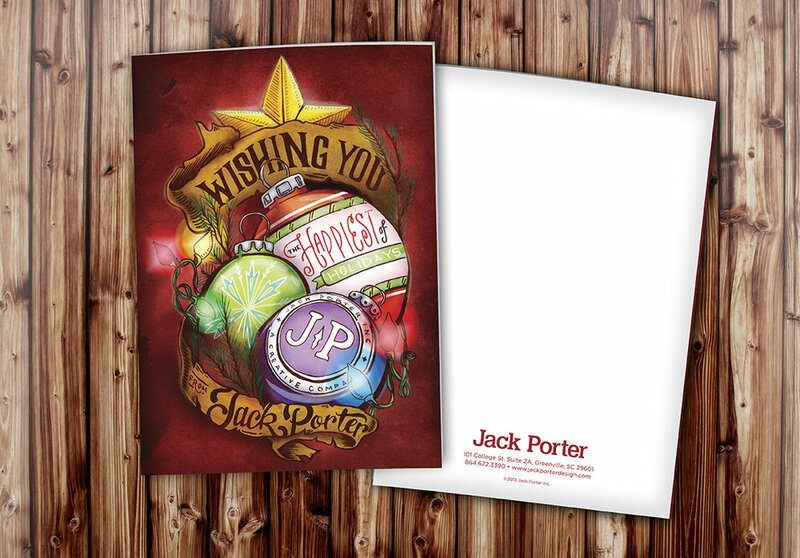 Touch base with your clients at the end of the year by sending out Christmas Cards from your business. Consider pairing your card with a branded gift—like a notebook and pen with your logo on them—for an extra special holiday touch! A logo on your vehicle gets the word about about your business and builds awareness wherever you go! Jon Maxwell of Cedar Lawn & Landscape added his logo to his company truck. Now wherever Jon drives or parks his truck, people are learning about Cedar Lawn. His customers’ neighbors will know where to get the same great service because they see the Cedar Lawn truck show up and create an amazing landscape. Tip: Vehicle graphics can range from a simple logo to a full “wrap” (full coverage of your vehicle). If you go with a more minimal design, I’d recommend adding your website too so people know where to book your services. You can use your logo for signs both outside and inside your business location. Outside, the logo lets people know your location and acts like a beacon calling customers into your store! Inside it gives a sense of place and helps further the customer’s experience with your brand. Illyria Pottery in Oxford uses two coordinating versions of their logo to create brand awareness. Outside, the letter mark grabs shoppers attention. Inside, the custom wood sign tells a story of hand crafted beauty. Brochures and handouts may seem outdated, but they are still are a fantastic way of getting your information into the hands of potential clients. Sharing that information alongside your company logo links those two things in the reader’s mind. If you are shipping your products, packaging is key to creating a memorable experience with your customers. Especially since they may not be able to visit your shop in person. Applying your logo to your packaging brings your brand experience right to their door—and can make a big impact! Tip: For more information on custom packaging, I recommend reading Jeff Sheldon of Ugmonk’s article, “Our ‘Secret’ Source for Custom Packaging.” Jeff rocks his custom packaging and gives an inside look on how he puts it all together (including his resources!). How many emails do you send in a day? Can you actually count them? Add a logo to your email signature, and you are automatically and easily creating brand awareness with the messages you already send. Tip: If you use G Suite (Gmail) for your email, you can easily create an interactive (clickable) email signature with your logo. For instructions, check out this article, “How to Create an Interactive Gmail Signature” for a step-by-step how to (with pictures!). Stickers and custom stamps are a great way to add your logo to product tags, mail, and more! It can seem like a little detail, but it is the special touches—like a custom stamp—that create a memorable experience. You don’t have to implement all of these strategies to bring big value to your business. Refer to your client process list and pick out what makes sense for your company. You might even come up with a few more ideas! I’d love to hear from you—Have you already added your logo to s? Where do you find the most value in using your logo to build brand awareness for your business? What does your logo bring to the table? If your logo isn't one that you're proud of, or doesn't speak to your company's vision, goals and personality, than maybe it's time for a rebrand. Tarva Design can help you get a logo you’ll love and apply it to all the pieces that follow. Set up your free consultation with us today to find out more.